Daz 3D announced a new free version of its 3-D art and animation package Tuesday while rolling out an enhanced version of the application featuring professional-level tools. The free Daz Studio 3 promises improved OpenGL preview display with new camera and light pointer tools, depth of field, and support for version 8.5 of Pixar’s RenderMan-compliant 3Delight render engine. Compatible with Mac OS X 10.4 and later, Daz Studio 3 is free to registered Daz 3D members. Daz Studio 3 Advanced, which targets 3-D animators, designers, and illustrators, features advanced render effects and shaders, Collada import/export, animation keyframe editing, figure mixing, and support for 64-bit systems. The $150 application comes pre-configured with Daz 3D content that can be loaded and rendered at the push of a button. 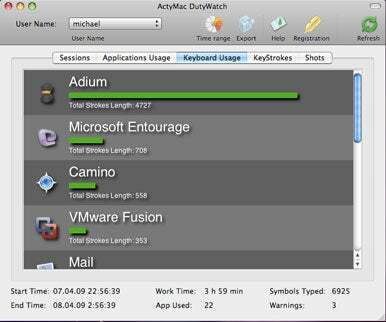 ActyMac’s DutyWatch is now at version 1.2. With the update, the application is now up to ten times faster, with a new database engine, warnings with SMTP support and bug fixes. DutyWatch is employee monitoring software; it records keystrokes typed and Web site visits, chats, employee e-mails and screenshots. The software features charts and graphics showing applications and keyboard usage, exports to other formats and more. Compatible with OS X 10.4 and 10.5, DutyWatch costs $100. The PDF merger-and-split tool Combine PDFs now supports Quartz filters, sports improved memory usage for combining larger files, and adds several new menu commands. The changes are part of the Combine PDFs 4.3 update released by Monkeybread Software on Tuesday. Combine PDFs is a $30 program that lets users merge PDF files and images into a single PDF file; the application also splits a PDF file into a new file with interleaved pages from two different PDFs. Support for Quartz filters lets users apply effects to content while writing the PDF file. Combine PDFs provides a preview panel that shows a selected page looks with when a filter is applied. Jumsoft’s Pages Clipart 4.0 expands the developer’s selection of illustrations for presentations, invitations, Web pages, posters, and other documents with 100 new additions to the existing 200 images. Image themes vary from office stationery to food, with the additions touching on vacation and leisure themes, as well as miscellaneous items. Jumsoft says there are more colors in this batch, aimed at enhancing users’ documents.